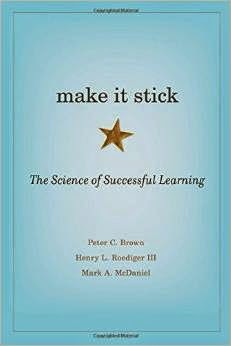 I have been reading the book Make It Stick and have come away with SO many ideas. I highly recommend the book. There are also some shorter ways to connect to the content here. I love this quote from the book "Learning is deeper and more durable when it is effortful. Learning that's easy is like writing in the sand, here today and gone tomorrow" (pg. 11). I think this is one to the key misunderstandings about learning. By making mistakes and then correcting them we strengthen our learning. As teachers there are ways we can use the information presented in this book to help our students become better learners and to deepen their learning. Testing is a learning tool and according to cognitive science research practicing retrieval is key. Practicing should be spaced, varied and interleaved to to be most powerful. So using quizzing before a lesson, after a lesson and students creating their own quizzes should we used more often. To that end, I reconnected to Quizlet. There is even an apple and android app. Below is the set of flash cards I created to help me learn the concepts in Make It Stick. I will continue to add to this. Now for just some random ideas and examples of things I would like to incorporate into my teaching. Write down 10 facts you didn't know before reading the chapter. I was thinking about adapting this and asking participants in a webinar to write down 3 things they did not know before the webinar. Retrieval practice that involves short answers and essay is more effective for long-term learning than multiple choice and true/false. Practicing via flashcards is super powerful. I would like to develop flashcards and provide a link to the set for participants to use after a training session. Mixing up the practice is important. Provide some space between practice sessions, interleave practice sessions with different content. Important to note that this will feel more effortful but will actually produce better learning. Also interesting is that even presented with this information will tend toward mass practice and rereading as ways of studying. I love this quote "Practice like you play and you will play like you practice" (p 52). Embracing difficulty is a key to learning. I love the idea of generation, being asked to supply an answer or a solution to something that is new to you. Give students some problems to solve before coming to class. Explain a concept in your own words. After a mini lecture, ask the class a few questions, but ask them not to refer to their notes. This way they need to think harder about the answer and thus strengthening the pathway to that new knowledge. Repeated retrieval is important to long term memory. Listen to an audio recording and explain one key take away in your own words. Could be shared in a small group. After listening to a recording, present students with some conceptual questions to talk about in small groups. Reflecting on one's own learning and making it into a story strengthens learning. This could be related to the role that structure building has in learning. The focus of dynamic testing is identify what areas you need to strengthen, refocus and then retest. The most powerful learning happens when wrestling to solve a problem. Elaboration involves finding additional layers of meaning in new material. Examples of this are in the use of metaphor and creating a visual image. In essence you are relating new material to something you already know, explaining it to someone else and describing how it relates to your life.